HOLDEN BEACH – The town board of commissioners has voted to put on hold all work toward getting a permit to build terminal groin and to seek more time for public comment on the proposed structure. The action comes just days after the Army Corps of Engineers released the final environmental study for the project that’s been in the works for the past two and a half years. The board voted Wednesday during a special meeting to direct attorney Clark Wright to submit a request for a 30-day extension to the comment period related to the final environmental impact study, or FEIS, for the town’s proposed terminal groin. The Corps released the study March 15. Public comments were to be received for 30 days, or until April 16. “My thinking is the more time we have for comment, the better,” said Mayor Pro Tem Mike Sullivan, who offered the motion to extend the comment period. He said the extension would also give the town board additional time to consider the report. The board also approved in a unanimous vote a motion that no town employee, agent, contractor, subcontractor or person representing the town before any federal or state agency shall take action that advances or terminates the current application process related to the terminal groin prior to a vote of the board of commissioners that restores such authority. The motion excludes work by Wright, the attorney who is working as a consultant to the town on the project. Kwiatkowski called the action “a time out” on use of time and money on the permit application process until the board is ready to proceed. “And then when everyone is on the same page and we have heard everyone and there is an opinion that can be formed, there will be a vote taken,” she said. 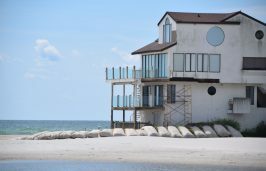 The project was proposed to address chronic erosion at the eastern end of the 8.1-mile-long barrier island. 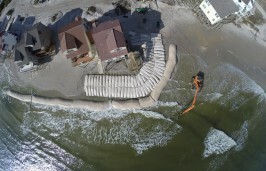 Erosion has led to dune breaching and flooding along the east end of town and has resulted in the loss of about 27 oceanfront properties since 1993. Average long-term erosion rates along the most affected area ranges from a loss of 3 to 8 feet per year, among the highest in the state, according to the study. The town had sought a permit to build a 700-foot-long terminal groin with a 300-foot shore anchorage system to be supplemented with a long-term plan for beach re-nourishment. The structure would also include a 120-foot-long “T-head” segment centered on the seaward end of the main stem to help minimize potential rip currents and sand losses during extreme wave conditions. Critics have said the $34.4 million project would benefit only a handful of homes, protect less than $1.2 million in tax revenue over 30 years and push chronic erosion at the east end of Holden Beach to spots farther down the beach. Town Manager David Hewett said the board’s action was a reflection of public concerns with the project. Three of the five town commissioners, Sullivan, Kwiatkowski and Commissioner Joseph Butler, were elected to their first terms in November in a race in which the terminal groin plan was at issue.